Seizures? Sleep disturbance? Intermittent Insanity? All caused by the full moon? The term “lunacy” originated in Europe, during the mid 16th century. It comes from the word “lunar” which refers to the moon. During the middle ages, it was believed that some people suffered from an intermittent insanity, which only occurred when there was a full moon. The perception was that a higher number of strange, agitated and violent behaviors occurred during a full moon. People began to fear the full moon and what kinds of unsound, disturbing events might take place. They blamed the full moon for any unusual events at night, when the full moon was in sight. Epilepsy was not understood at the time. When someone had a seizure people thought it was brought on by demons. If this happened to coincide with a full moon, then of course, the moon was blamed for it. “It is the very error of the moon. But is it true? The old belief is still alive and well. People often say and I am sure you have heard “It must be a full moon.” This is said in attempt to explain any unusual, seemingly unexplainable happening in the night. 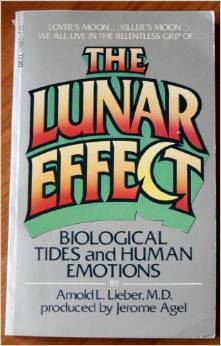 Psychiatrist Arnold Lieber wrote the book The Lunar Effect : Biological Tides and Human Emotions. Lieber hypothesized that the moon had an effect on the water molecules in the nervous system. The disruption of the water molecules would cause certain people to behave strangely. Popular legend says that there is more violence, more suicides, more accidents and more aggression during a full moon. This is a common belief amongst healthcare workers, policemen and paramedics. There is a controversy as to whether or not there is a connection between the moon and seizures. The electrochemistry of the brain of patients suffering from seizure disorder may be affected by the moon. There has been research done to see whether or not there is any validity to the theory that the moon can affect the water in our bodies. The evidence suggests that this is impossible because the amount of water is too small. There is research which indicates that the moon does have an effect on sleep. A study was done by scientist and author, Christian Cajochen at the University of Basel Psychiatric Hospital in Switzerland. As far as violent crime, suicide and problems with patients in psychiatric wards, the evidence in not consistent. The suicide rate does not change during a full moon. There are varying reports about violent crime. If you like the old tales of werewolves and vampires, as I do, then maybe it is best left to the imagination as to whether or not the moon really can change people’s behavior. I personally have not seen any difference in dementia residents during a full moon, The most common catalyst to an uproar in the dementia ward, is that the first patient will become aggressive in a room full of other residents, The behavior of the initiating resident frightens and upsets the other dementia residents. It is like a domino effect.